Journalism is something I enjoy all the time. Somehow I couldn’t pursue journalism as a career. As I shared my teenage investment experiences in an earlier post here, sharing some teenage journalism experiences in this post. Member of advisory board, Silicon Times. I also did some freelancing for a person called Prasad who was running a not so popular Kannada fortnightly which had circulation of just few thousands, covering mainly south Bangalore city. This person had pass to enter press Gallery in Vidhana Soudha. Once he took me to a press conference organized by Hannover Messe (Hannover Fair, a popular exhibition event held in Hannover, Germany every year) organizing committee which was held in Lee Meridian Hotel, Bangalore sometime in late 2004/early 2005. That was my first and most significant press meet I ever attended. I was asked to join only few hours in advance and wasn’t given any briefing as to what this press meet is about, hence I couldn’t prepare well for the same. While most of the invitees were given only a notepad and pencil at the reception, I was given a big press kit as I gave my press card. This press kit had all details pertaining to Hanover Messe and Ligna (Ligna is a separate event focusing on Wood Industry), a CD full of high resolution photos. I have not discarded that press kit yet and believe it is lying somewhere in my house along with other similar objects of historical/emotional significance. Senior executives in charge of Hannover Messe had flown in from Germany and I attended their presentations with utmost interest. They explained how Hannover Messe is attracting more and more participants every year and how participating in that event would generate value etc. Next they covered LIGNA, a dedicated fair for those involved in wood industry. Ligna would showcase latest equipments that can be used to cut more and more trees in less time, technologies to process a chopped tree etc etc. The presentation also explained how much percentage on earth is still green and how much potential wood cutting industry has! I wanted to ask a question “What compensation plans you have to reduce the environmental impact you’ll be causing by promoting deforestation”, but for some strange reason that question never came out of my mouth. In that meet I could get first hand experience of speaking to German people and made an attempt to understand their accent. I still cherish that press meet as it was my first face to face exposure to international community. I did some freelancing for Vijay Times, the then English wing of Vijaya Karnataka daily. I worked for one lady called Vijayalakshmi, who was in charge of NIE (Newspaper in Education program) and was also heading a NGO called Sahaja Foundation. Her face was looking quite similar to that of my mother and she also had a son named Shrinidhi! First day I met her I had a severe competition, from a lady who had M.A in journalism. But that lady wanted desk job while VT wanted someone to do field work. Hence I got an upper hand. I covered several school events for them. Once I was also sent to Kolar to cover an event there wherein a senior air force official addressed the school children about opportunities of pursing a career in Indian Air Force and benefits one would get by doing so. Few of my reports got published while many didn’t, though I got paid for all the reports I’d submitted. But they were not publishing my name in the reports, because they were very minor event reports to put reporter’s name beneath (Most of them were like “An inter college basket ball tournament was held in ABC school and XYZ school were the champions, Mr. ABC distributed the prizes and said basket ball should be given more importance and funding by the government”). I enjoyed this stint as reporter. Any organization you go, you’ll get lot of importance if you are a reporter. Senior people at the event would instruct their subordinates to give you any information/help you need. Occasionally you may get some free bees or good lunch/dinner as well. But there was a flip side also- Most of the reports we submit might not get published, either because there’s not enough space or editor thinks a particular event not important enough. But the organizers of the event I reported would always think that I didn’t report the event properly. (An inter school volley ball match is hardly a news for a state level newspaper, but schools do await publication of their events eagerly and one can understand their disappointment if it never gets published. I was risking my credibility because of this) Also I had to listen to statements like “Deccan Herald gave us a very good coverage last time while your paper didn’t publish any photo of the event” or “it may take some time for us to send photograph of the event, why don’t you publish my photo instead”…Eventually I stopped taking any of these assignments mainly because my exams were nearing and besides I was not getting any credit for my work. That basic reporting wasn’t much fun either. Even that lady (Vijaylaxmi) left VT after sometime. You’ve been short listed for a senior position in a Delhi based company and if you’re interested we’ll send you air tickets shortly so that you can come to Delhi to attend final interview. By the time I reached end of this letter I was sure this is a fraud. It had no name on it, by no means I was eligible for a senior position and it is very strange for a company to ask for money. I decided to investigate- I went to Chamrajpet branch of ICICI and told the lady at the counter “I have an account number, can you tell me if it is current account or savings account”. The lady looked at the account number and said it is a savings account. That confirmed my doubts (Companies wont have savings accounts, only individuals will). I sought permission to meet the manager and I was allowed in. I showed the manager a printout of the mail and said I’m suspecting it to be a fraud. The manager was very helpful. He logged in to his computer and had a look at the account in question. He said that the account was held in one of their branch in UP and the account was getting hundreds of deposits ranging from Rs 500 to 5000 from all over India and the money was being withdrawn through ATM every few hours. He was convinced something is fishy and said he’ll write to the manager of that UP branch about the suspicious activity in this particular account. I wanted to file a police complaint on that person for possible fraud but I didn’t have a strong case. I’d lost nothing, I didn’t have enough evidence to convince police that it is a fraud and since other person was in other part of India local police may not be able to do much, except may be refer it to UP police. It was too much of complexities for me to enter into at that time hence I backed off. One week later I checked with the ICICI branch manager who said that he’s yet to hear from his UP counterpart. I left my email ID with the manager but never got any updates from them. Hope that person was nabbed and thousands of people were prevented from loosing their money in the hope of a dream job. Another small article got published in Youth Express, an Indian Express (now “The New Indian Express”) supplement. [Read that here] I wrote few articles for a Mangalore based local paper, called Kaanunu Loka. Most significant work in print media has been publication of a Kannada story in Sudha Magazine during September 2001. Another half page article got published in Vijaya Karnataka during April 2003- Read that here. 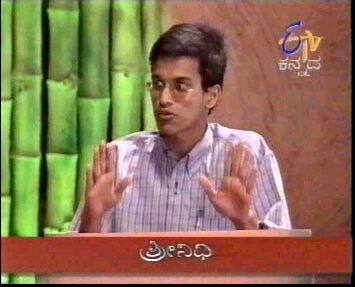 Sometime in 2002 I even managed to take part in an ETV Kannada television show. Details in this post. Because of freelancing I used to stay away from the bunch in my peer group. While others spoke of the movies they saw during the weekend or the places they visited, I used to say "I attended this press conference" or "wrote an article on that" or "had to visit that school where this event was going on"
Thinking of diverting attention from blogging and try writing few articles for print media again. good to read your nostalgic journalism experiences. Good to read your young journalism experiences. Thats an interesting account of your early experiences. All the Best if ever you get back to front line Journalism. Thanks for the comment. I don't think I will be entering mainstream journalism again. It was rather interesting for me to read that blog. Thanks for it. I like such themes and anything connected to this matter. I would like to read a bit more soon. It is certainly interesting for me to read the article. Thanks for it. I like such topics and everything connected to them. BTW, try to add some pics :).